In February 2017, Acumatica announced Acumatica 2017 R1 Release with several major enhancements to the Acumatica platform. Users may choose a simplified interface with better drilldown from dashboard widgets. Acumatica integrates with the open source app repository on GitHub.com to give you easy access to services such as Box.com and Survey Monkey. Acumatica has long been known for its superior mobile functionality. Users on the go can now use parameters to create custom reports, and then download PDF report files to their devices. 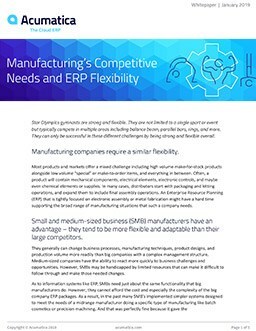 Although most customers work with Acumatica partners to implement Acumatica ERP, some customers have asked for direct access to Acumatica technical resources. These customers have previously been able to meet their needs through Customer Premier support. To give you another option, we’ve launched Standard Support—a new level of support that offers chat support, online incident management, and 8-to-5 coverage with a next-day Service Level Agreement (SLA). Standard Support is free for the first year of a customer’s implementation. As Acumatica continues to grow rapidly, we are still making quality, stability, and performance our top priorities. Here are some enhanced features we released in Acumatica 2017 R1 Release (6.1) on January 31, 2017. Approvals of Expense Receipts. Acumatica ERP now provides functionality that lets you set up the process of approving expense receipts submitted by your employees. Enhanced Recognition of Pending VAT. Acumatica ERP now supports the legal requirement in some countries that VAT should be recognized, accrued, and included in the tax report only when payment is received for the taxed goods or services. Change of the Customer in Sales Orders. You can now save time in creating a new sales order by copying and pasting a previous sales order and then simply changing the customer ID. Use of the Warehouse Shipper Address. If your company is configured as one branch that uses multiple warehouses without multi-branch support, you can use the shipper address from one particular warehouse in documents. Partial Receipt of Two-Step Transfers. Acumatica ERP now lets you receive partial quantity of stock items in transfers. Enhanced Access Rights Management. You can now more easily manage users during user type configuration and set up access rights inheritance. EULA Acceptance. You can accept our end-user license agreement (EULA) online. Integration with Power BI. You can not only build a Microsoft Power BI tile in a dashboard, but also embed a Power BI report on a separate page. These are just some of the highlights of Acumatica 6.1. Customers and partners can download the complete Release Notes . We answer the top 10 questions about ERP to help you find a solution faster.